This pair is my go to pair and has a special place in my heart for a number of reasons. The first of which is the denim itself! The denim is from Potter Textiles in Perth and is probably the softest stretch denim I have sewn with. It is just beautiful. It has a rather large amount of stretch (30%) which makes the fit of this pair a lot looser, but it’s nice for a change. This denim lost a lot of dye in prewashing – i washed it three times with vinegar until it was no longer turning the water blue! How crazy is that? I’m still a little nervous about the dye so i only wash it with other dark wash jeans. The cut is the Version 1 slim leg jean, and i think it’s my favourite cut. 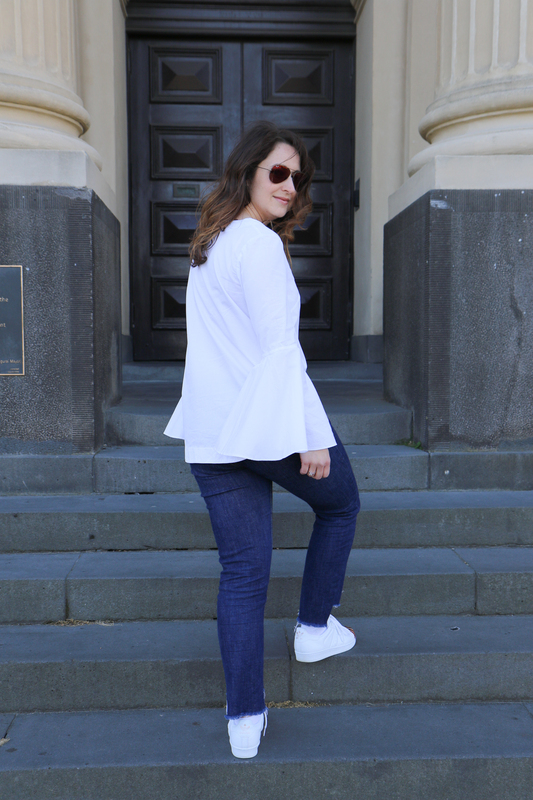 It’s looser around the knee, calf and ankle than the skinny leg jean, and I am really enjoying it as a change from all the skinny leg jeans i’ve been wearing for years. Is anyone else at that point? I used very bright gold topstitch thread (Gutermann colour 415) because i really wanted a lot of contrast (It’s the same topstitch thread that I used in the V1 sample sewn with light wash denim). 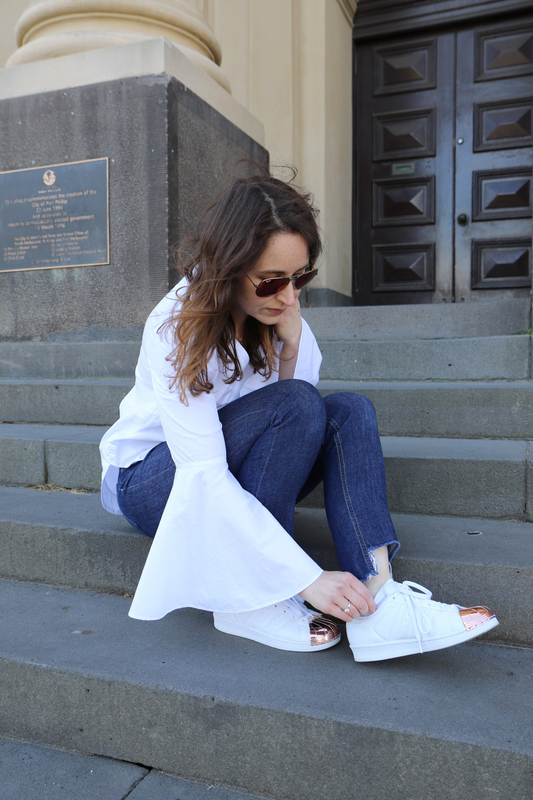 I feel like making a very conscious decision about what notions you use with your jeans makes all the difference. 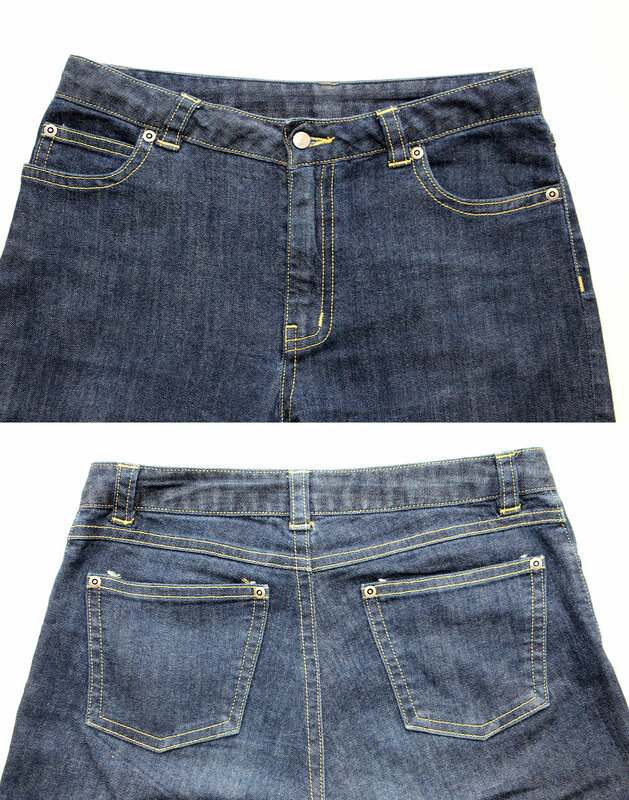 I used the Nickel colour jeans notion kit from my store, though the button i used is much smaller (i initially bought 14mm jeans buttons and found i really didn’t like how tiny they were). I’ll be replacing this button because the size is driving me insane. 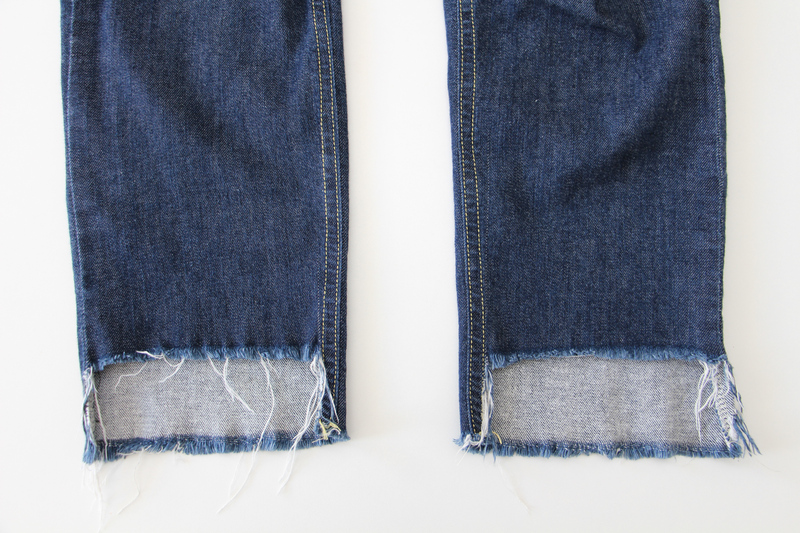 And lastly, for the hem i recreated a trend i’ve seen all over the place in the last year – a frayed step hem. This was honestly so easy. I literally just cut the jeans at regular full length and then cut the front a few inches shorter. I just let the fray develop naturally, and I really love how it turned out. 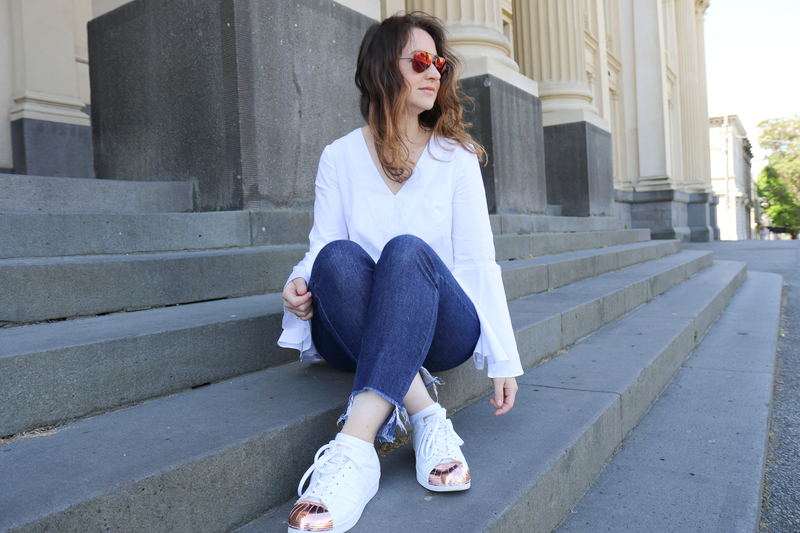 I love shoes (as you have probably noticed) and i feel like the stepped hem allows your footwear to stand out a bit more. 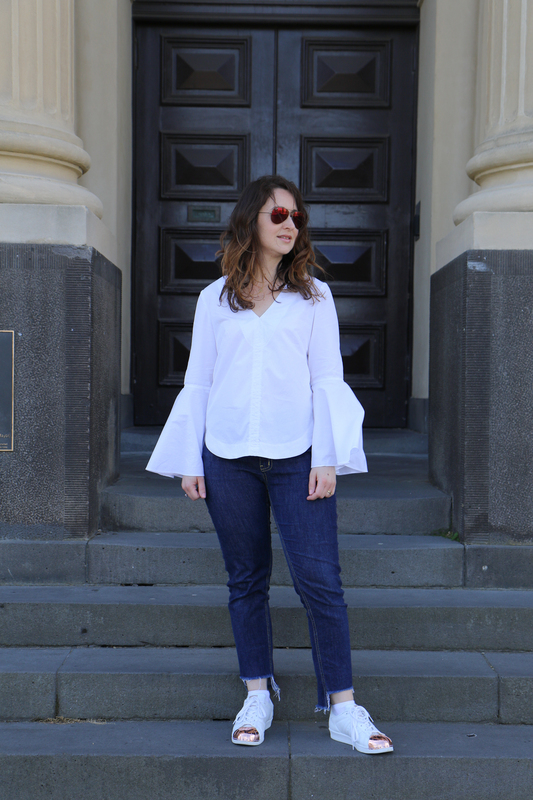 I desperately want to do more step hems on my jeans, but know that when recreating a trend it’s probably best to stick to one wardrobe piece as otherwise you risk your entire wardrobe being out of style in a year. Darn that required self control! 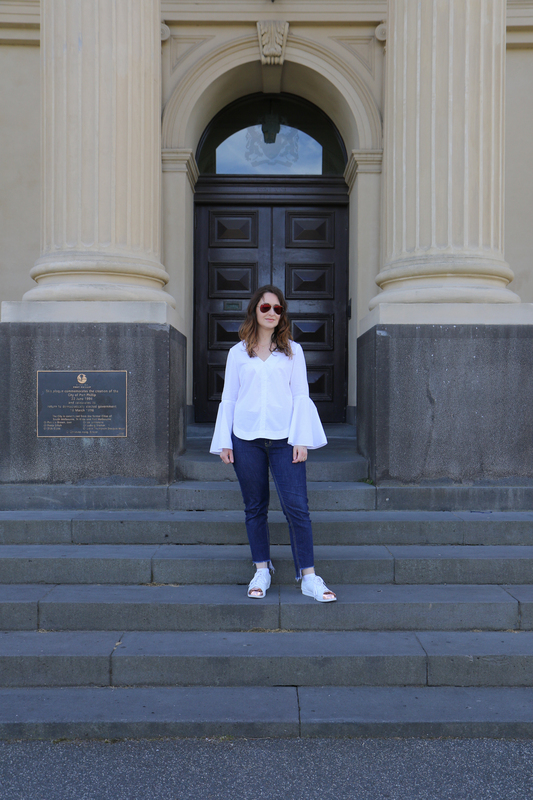 These photos were taken by my lovely sister in law Annelise when I visited her in Melbourne at the end of last year, and they ended up being the jeans i wore on both plane flights because they were just so darn comfy! 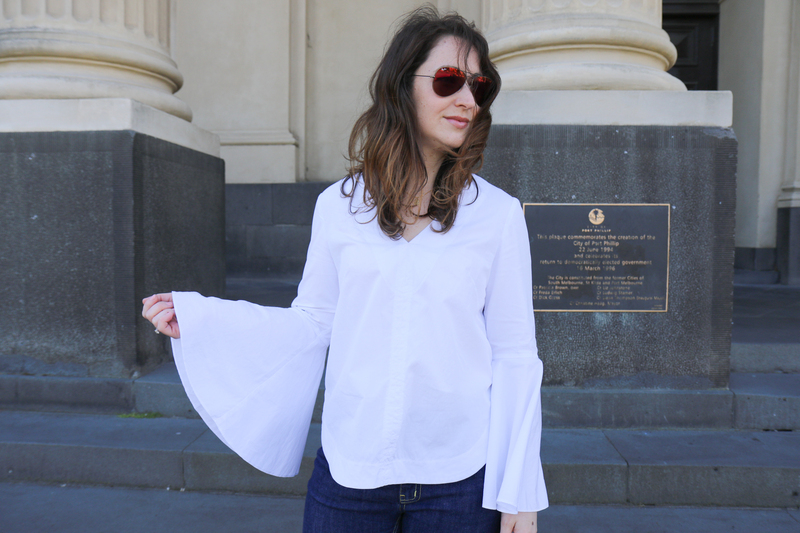 I’m also wearing my Dove blouse in crisp white shirting again, because I just can’t get enough of it! 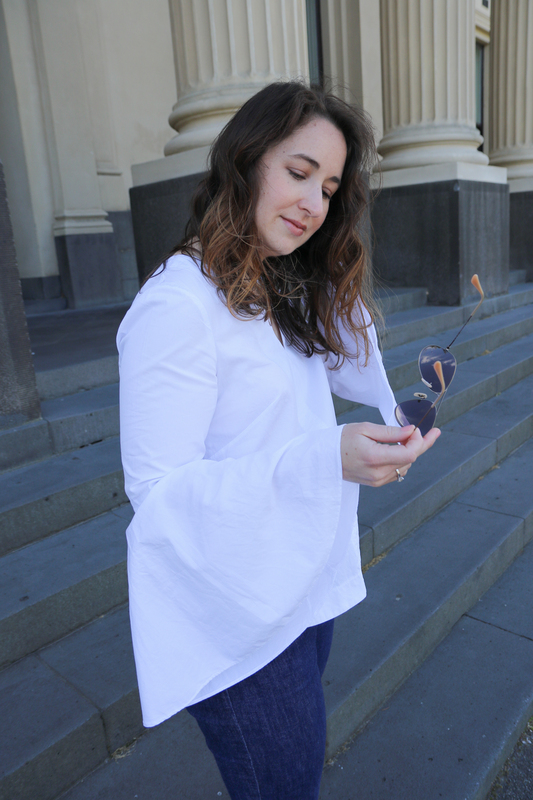 It’s crazy to think how long i waited to make this blouse, and now it’s in constant rotation. 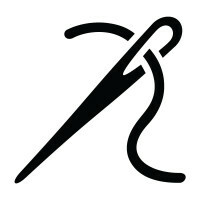 I guess it’s a real lesson in prioritizing sewing the things you really love. Though the more I talk about sewing things you love, the closer i am to sewing another pair of step hem jeans hehehe.